Summary: Barbarians, Martians, Kung-Fu, magic, 70s disco. This story has it all! 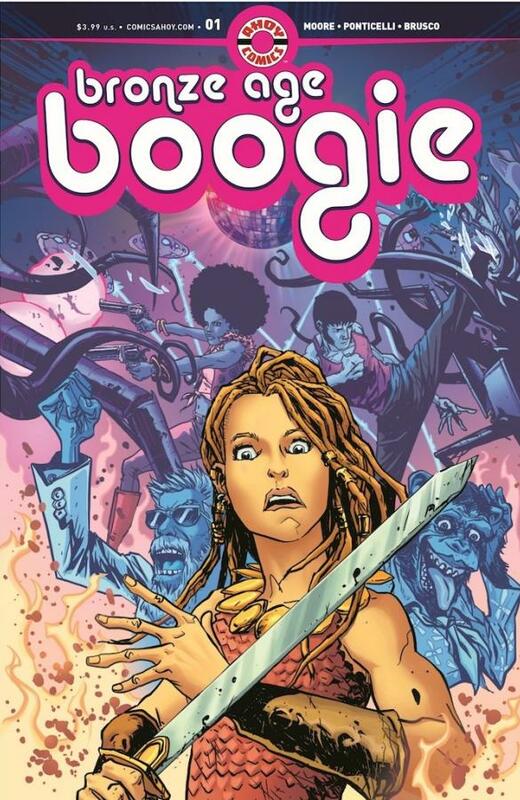 Bronze Age Boogie is the new genre-mashing, swords and sorcery, Kung-Fu, sci-fi adventure epic from AHOY Comics. Written by Stuart Moore with art by Alberto Ponticello and Giulia Brusco, this jam-packed comic also features an assortment of AHOY extra text stories, comics and various other goodies in the back. The story begins in New York 1975 A.D then quickly jumps back to barbarian wilds of 1975 B.C. The basic plot bounces back and forth from these two time zones, where we get to meet a variety of interesting and somewhat curious assortment of characters. 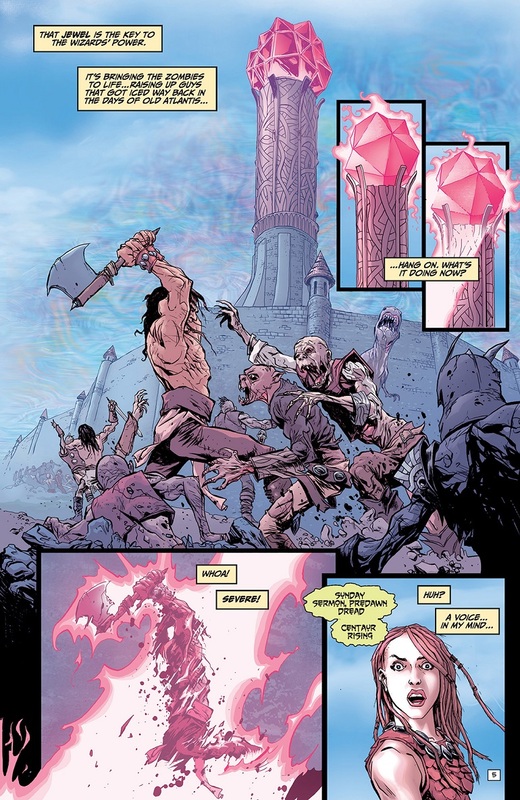 The main character is Brita Constantina, a young barbarian princess who is loyally following her father into battle against necromancers, who use their powers to create an army of the undead. 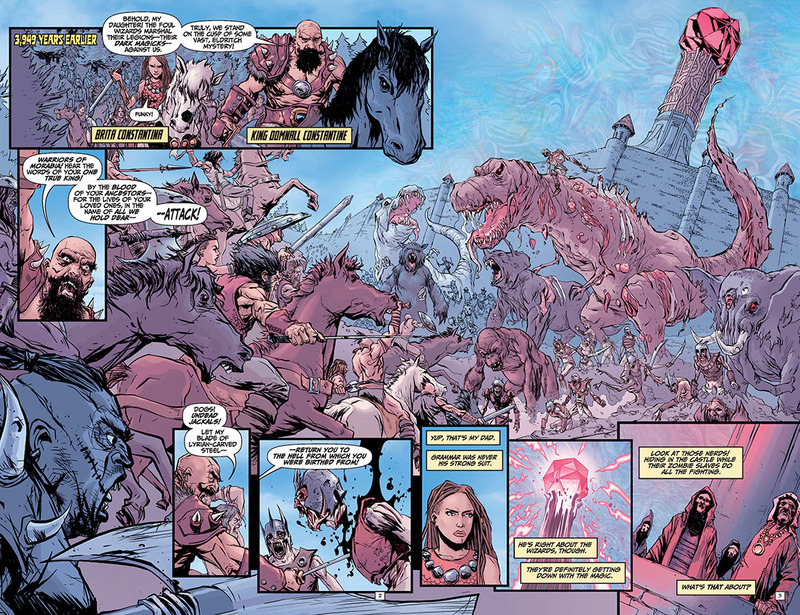 Their army is made up of humans, dinosaurs, elephants, orc-like creatures and giant apes, all at various stages of decomposition. Wonderful! These dark wizards are trying to keep the barbarians out of a mysterious region called the Taboo Zone, a place of ancient power surrounded by a powerful magic barrier. Unfortunately, the barbarian army is overwhelmed by the undead, forcing the king to retreat back to his camp. Once back in her tent, Brita reflects on the battle and the appearance of a strange disembodied voice that began talking to her inside her head. It sounds like a lot of rhyming nonsense, but the voice concerns her as these cryptic ramblings could point to something much more sinister. 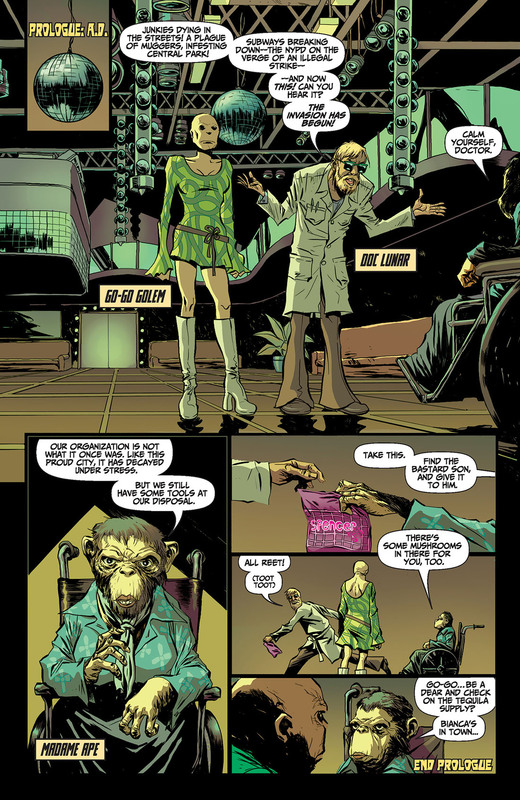 Things from this point onward progressively get more complicated, with the arrival if a coke addicted talking ape, a Martian invasion, a disco ball and a 1970s platform wearing go-go dancer. 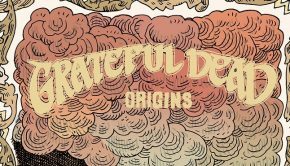 OK, I’m just going to say that there is a LOT going on in this first issue, with various timelines, characters, plot devices and developments cropping up. Seriously, this story is filled with everything you ever loved about 70s comics, from monsters, aliens, martial arts and swords and sorcery. It’s an absolute melting pot of genres, all coming together to form a completely wild and whacky story unlike anything I’ve read before. It’s a hoot and a lot of fun to read, and the light-hearted and funny dialogue and banter between characters makes it very enjoyable. I’m looking forward to what future issues have in store for us. Whilst this first issue is jam-packed, it is no way overwhelming or difficult to read, and I commend Stuart Moore for cleverly crafting something as immense and vast as this with such a punchy and well-rounded introduction. 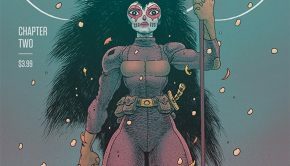 In fact, the entire first issue flows rather effortlessly and with a sense of ease considering the large amalgamation of genres. 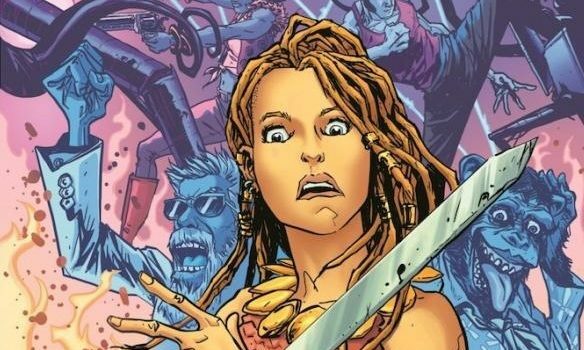 I often see writers trying to cram countless ideas, developments and characters in a single issue, which often results in complicated and messy storytelling. 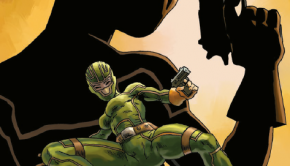 So, for me personally, it’s always refreshing to come across a story that has a lot to tell but decides to holds back a little, only showing small glimpses of what’s to come instead of trying to cram it all in one issue. I should also mention that being an AHOY Comic, there are a bunch of extra goodies at the end of the issue, which includes a letter from Stuart Moore, a short comic about the first bear in space, hilarious animal incident reports about two giant menacing squirrels and The Evil Animal Alliance and a short piece on how to beat writers block. These extras, which make each comic feel like a comic magazine is one of the reasons why I love AHOY so much. The art is by Alberto Ponticelli, who does a great job at capturing the vast scale and enormity of the story. 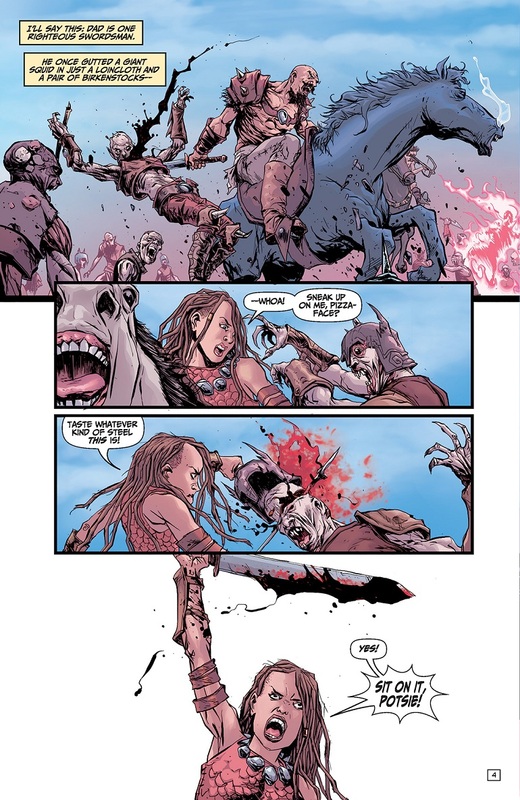 Ponticelli certainly flexes his artistic muscle, giving us epic battles with axe-wielding barbarians, armies of the undead and dark magic wizards. Not only that, but we also get to see the 70s disco era, with flares, giant afros alongside Martians, spacecrafts and chimps. Just from my brief description, there is a lot to look at. I also really enjoyed the exaggerated expressions on the characters faces, finding them to be highly expressive and nuanced in their own unique and particular way. 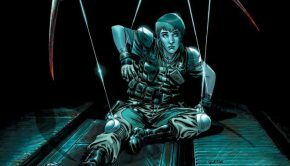 The colouring by Giulia Brusco works really well alongside Ponticelli’s art, helping to reinforce the tonal shifts in the story, especially during some of the more intense scenes. Overall, I thought that this was a strong first issue. The concept, characters and plot is original, funny and bold. Seriously, check this one out.